The bottom terrace has mostly dried out and baleage has been harvested, 5 of 9 beet paddocks sown (Jamon), more area identified for baleage and a herd test completed. Pasture samples have been taken to measure the feed quality in the young grass area (sown last autumn) and in the small amount of older pastures. The young grass area has little clover content yet. Waiting on test results for pasture ME on High FVI, Low FVI new grass swords and older pasture with normal clover content. Pictures below. AB finished on the R2 heifers and Jersey bulls running with them on the young stock block. First CIDR round complete at the start of AB on the herd (88 cows). Four even herds run on set farmlets. Per cow production peak has been impacted by the mid July calving date, herd make up of 30% heifers and pasture feed quality in the first round affecting the early calving cows (10.1ME measured). Current production is being maintained. The four herds are to remain on their allocated farmlets at all times. The 2017/18 season aim is to feed all cows in a similar manner all season. Any differences to be recorded. OAD (BCS of 4 or less) cows can be fed extra supplement in the shed as required by the farm team but must remain with their allocated herds for research purposes. Concentrate in shed is a 50:50 mix of PKE and barley. Fodder beet (lifted at the end of the winter as surplus to requirements) is being fed just to utilise within the system. Research stipulates no more than 2kgDM fodder beet to be fed per cow so that we don’t impact the winter feed trial. Fodder beet will be finished in the next 10 – 14 days, no plans to replace this with anything else but pasture. Total area includes 327ha(eff), 32.5ha(eff) young stock block and 294ha(eff) platform. Winter crop is grown on both blocks for all stock. Crop rotation is two years in crop then re-grass. PGG Wrightson grass cultivars used are Rely, Platform and Excess, all diploids. Where target residuals are missed, topping after grazing is the tool the farm team use as needed. 5 of 9 fodder beet paddocks planted (Jamon)by the 2/11 and baleage is being placed on crop paddocks as it is made. 15t of Whole Farm Spring Boost Fertiliser (as per Ravensdown recommended Agronomy Plan) was applied at 187.5 kg/ha to 80ha last week. The remainder will be applied weekly following the cows. We require 30 cows on average daily to achieve target submission rate. With our calving spread of 17 weeks this spring we consider an emphasis on bringing our later calving cows forward over time. R2 heifers are now all on the young stock block after spending some time on the platform over AB to make use of the yards. R1 heifers are being weaned as they hit 85kgLW and will start being transferred over the river next week. Later born heifers are being fed a mixture of milk from the sick herd and powder to finish them off along with meal. Pasture growth recordings, herbage sampling and analysis. Fortnightly herd test and BCS testing for the whole herd. Daily record of animal health incidents (lameness, mastitis etc.) Fortnightly updates results so far from DairyNZ. The farm team have started Lean through DairyNZ requiring fortnightly meetings off farm. A very busy time to be off farm but with a need to develop new systems for everything we do there is no better time to start this. With the research requirements on the team we are advertising for a new staff member to join us. Normal daily jobs have double the workload here (for example we have 4 herds to get in each day rather than 2) which has placed a strain on the current team who have done a fantastic job. 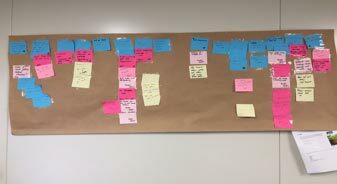 First example of process mapping that we started with for milking.